This MAb reacts with a 200 kDa and 68 kDa protein, identified as heavy and light sub-units of neurofilaments (NF-H & NF-L). This MAb reacts with a 200 kDa and 68 kDa protein, identified as heavy and light sub-units of neurofilaments (NF-H & NF-L). Neurofilaments make up the main structural elements of axons and dendrites and are found in neurons, peripheral nerves, and sympathetic ganglion cells. Neurofilaments consist of three major subunits with molecular weights of 68 kDa (NF-L), 160 kDa (NF-M) and 200 kDa (NF-H). Anti-neurofilament stains a number of neural, neuroendocrine, and endocrine tumors. 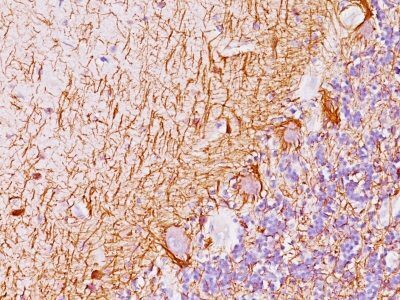 Neuromas, ganglioneuromas, gangliogliomas, ganglioneuroblastomas, and neuroblastomas stain positively for anti-neurofilament. Neurofilaments are also present in paragangliomas as well as adrenal and extra-adrenal pheochromocytomas. Carcinoids, neuroendocrine carcinomas of the skin, and oat cell carcinomas of the lung also express neurofilament. 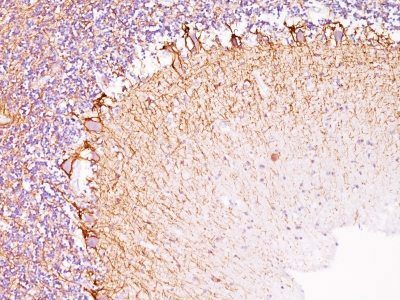 Catalog number key for antibody number 0756, Anti-Neurofilament (NF421 + NFL/736) The prefix indicates conjugation, followed by the antibody number and size suffix.